Ok, so I know I am in the minority as a Windows Phone user, but sometimes I just get frustrated and I wish Microsoft at least tried to achieve parity with their platforms, and not leave it to others who just won't bother. I have a really nice Acer Liquid Jade Primo Windows 10 mobile phone. Continuum, Hexa Core Processor, 3GB memory, nice 5.5" screen, great camera. Yesterday I went shopping and saw the really nice Fossil Q watches. (Further disclaimer: I already own a really nice Fossil Mechanical watch, and a Microsoft Band 2) They were really nice, but I had to walk away. Why? Because they run Android Wear. Now, technically, there is no limitation that says "because it is Android, it will not work with Windows". It has even been proven possible by an independent developer talking to the Bluetooth APIs, and Windows has some really nice API hooks already to allow smart devices to hook into many parts of messaging and notifications. It's just that Google has no inclination to write a Windows Phone 8 or Windows 10 UWP app that supports it. They wrote an iPhone app, though. Because otherwise how will their hardware and software compete with the Apple Watch? What makes me frustrated isn't that Google isn't supporting Microsoft's business plan, and the progress of their competitor to Android, It is actually that Microsoft doesn't seem to be doing anything to provide these missing applications themselves. If you are willing to write apps for Android Wear, then why not allow those apps the chance to work with a Windows Phone? 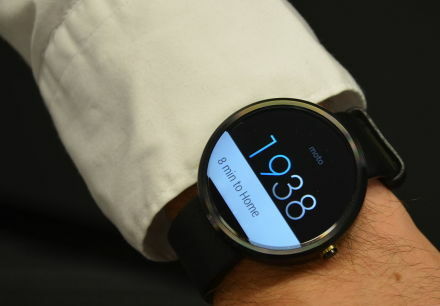 Microsoft Research, I would love to see you release something awesome in the Android-Wear client app space. Just one more stone on the scales tipping them in the wrong direction that might one day force me to buy an Android.